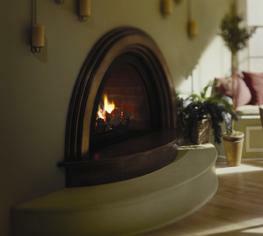 Enjoy the excitement of a traditional kiva fireplace right inside your home, with the Bravo fireplace. The stylish southwest design of this ceramic fiber direct vent will add a dramatic flare to any room. Its unique shape and clean-faced style offers a myriad of options for installation. The firebox is brick stamped for added authenticity has an expanded viewing area for a full view of the beautiful fire.